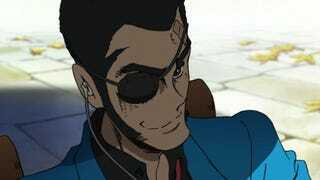 Some of the first images of upcoming Lupin anime spin-off Lupin the IIIrd: Daisuke Jigen's Gravestone have hit the web. And Lupin (above) has somewhat of a Big Boss thing going on. Not a bad look at all! Courtesy of website Crank-in and tipster Lee, you can see the first images of the upcoming feature film, which follows how master thief Lupin and his sidekick Jigen (below) became partners. Lupin the IIIrd: Daisuke Jigen's Gravestone is being directed by Takeshi Koike of Redline fame. According to Crank-in, the movie will get a limited theatrical run in Tokyo's Shinjuku this June.